Please pardon our mess. You may notice some noise and dust on the main level of the library close to the lobby. We are working to consolidate our offices for Interlibrary Loan (ILL). Once the project is done, both ILL Lending and Borrowing will be located on the main level of the library. This will allow for more efficient use of personnel and resources and open up space for another group study room (222) on the upper level of the library. If you need a quieter area for studying, please try the lower or upper levels or areas on the main level that are not close to the lobby. Staff member Rachel Manzer has moved to a new position within Briggs Library. On August 3rd Rachel took charge of the library’s document delivery and interlibrary loan services. Rachel began working at the library in October of 2007 as our Interlibrary Loan Lending Technician. The Document Delivery Unit offers a vital service to SDSU students, staff, and faculty by providing access to resources not owned by Briggs Library. When researchers discover that they need a resource that is not available through the library, they may request the item using the ILLiad (InterLibrary Loan internet accessible database) system. Once patrons place requests, Rachel is in charge of all the behind-the-scenes work. With the help of student assistants, Rachel maintains patron accounts; verifies citations; ensures copyright compliance; and places requests with other libraries, commercial vendors, or the library’s acquisitions department. She also manages fees, coordinates delivery, coordinates returns, and handles problems. The Document Delivery unit also lends Briggs Library materials to other libraries through a worldwide interlibrary loan (ILL) network. The network allows Briggs Library to participate in reciprocal lending activity with thousands of other libraries which helps the service operate economically. This means users usually do not pay a fee for the resources provided through Document Delivery or Interlibrary Loan. In her former position, Rachel worked with ILL lending, and, in fact, she will supervise that operation when the ILL staff vacancy is filled. Congratulations to Rachel Manzer. Questions about specific Document Delivery (ILLiad) requests can be directed to Rachel in her new office (106C) on the main level of the library. For help with finding potential sources for your research or placing ILLiad requests please contact a staff member at the Library Services Desk, by phone (605-688-5107), by e-mail, or via instant messaging. A lot of work at the library goes on behind the scenes. Read about the success of one department below. Through Interlibrary Loan Services, SDSU students, staff and faculty members may request resources not found in Briggs Library collections. Often the ILL Department can borrow or gain access to resources from another library in a week’s time. The flip side of ILL is that the library lends our resources to other libraries. Reciprocal lending agreements with other libraries allow us to operate ILL services economically, meaning users do not usually pay a fee for the resources provided through Interlibrary Loan. Briggs Library is a member of a library consortium called Minitex, which provides services for Minnesota, North Dakota, and South Dakota libraries. Minitex recently recognized Briggs Library as number four on its list of top ten ILL lenders, with 5,509 ILL requests filled in 2008. Kudos to ILL Lending Technician Rachel Manzer and her student assistants for their hard work. Rachel M. Manzer joined the Briggs Library staff this October as a Library Technician for Interlibrary Lending. Her primary responsibilities include lending our library materials to other libraries in South Dakota, across the country, and even around the world. 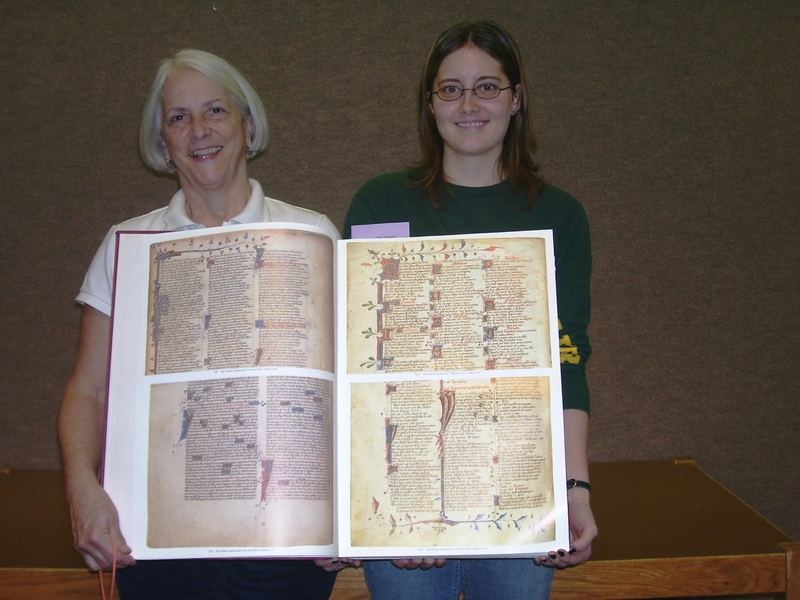 She will also process thousands of requests annually for scanned copies of articles from Briggs Library periodicals. In addition, she will supply SDSU distance learners and faculty with materials from our library directly to their homes, offices and computers. Rachel comes to the library from a previous position with SDSU University Relations where she scanned and cataloged current and historical images of SDSU. Rachel has an Associate of Arts degree and an Associate of Science degree from Cottey College in Nevada, MO, and a Bachelor’s degree in Liberal Studies with a concentration in Philosophy, Religion & Ethics from SDSU. Rachel grew up in Brookings and is a graduate of Brookings High School. She is now making Brookings her adulthood home with her 4-year-old son, Elijah, and their dog, Luna, in addition to four fish, three snails, and two mice. Rachel enjoys spending time with family & friends, knitting, reading, watching movies, listening to and playing music, and learning new things. Enter your contact information just once when you set up your ILLiad account–no more repeated keying of personal data! Make interlibrary loan requests and check their status 24/7. Edit and resubmit canceled requests quickly, easily. Add notes and view staff annotations on your requests. Check your own account for due dates and history of past requests. Request renewals online at any time. Faculty can authorize student assistants or support staff to pick up requested materials. Web delivery of most requested photocopies. If you have concerns or questions about ILLiad, please contact the ILL Office at 688-5573 or SDSUILL@sdstate.edu. You are currently browsing the archives for the Interlibrary Loan category.